Jesse Adam Eisenberg (born October 5, 1983 in Queens, New York) is an American actor. He is known for playing the roles of Walt Berkman in The Squid and the Whale, James Brennan in Adventureland, "Columbus" in Zombieland, Mark Zuckerberg in The Social Network, Blu in Rio and as Lex Luthor in Batman v Superman: Dawn of Justice (2016). 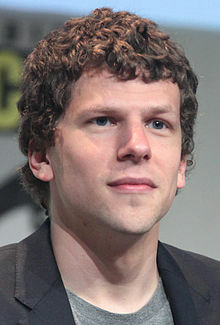 Eisenberg received an Academy Award nomination for The Social Network. Eisenberg grew up in a non-religious Jewish family. His name Eisenberg translated from German means: iron mountain or mountain of iron. He was nominated for the Orange Rising Star Award in 2010. Eisenberg is fond of cats and has been involved in fostering the animals. He is a vegan. In 2013, he began dating his The Double co-star Mia Wasikowska. The two split in 2015. ↑ Burkeman, Oliver (30 April 2011). "Jesse Eisenberg: Knocked sideways". The Guardian. London. Retrieved 12 January 2016. ↑ McGlynn, Katla (19 November 2010). "Jesse Eisenberg Talks Being The 'Sexiest Geek Alive' & His Love Of Foster Cats On 'Conan' (VIDEO)". The Huffington Post. Retrieved 12 January 2016. ↑ "Jesse Eisenberg and Mia Wasikowska go public with their romance as they kiss publicly in Toronto - Daily Mail Online". Mail Online. Retrieved 7 October 2014. ↑ "Mia Wasikowska on doppelgangers, dancing and developing survival instinct". The Independent. 30 March 2014. Retrieved 9 November 2014. ↑ Finke, Nikki (April 6, 2012). "Jesse Eisenberg Is Leaving ICM For CAA". Deadline. Retrieved April 7, 2012.